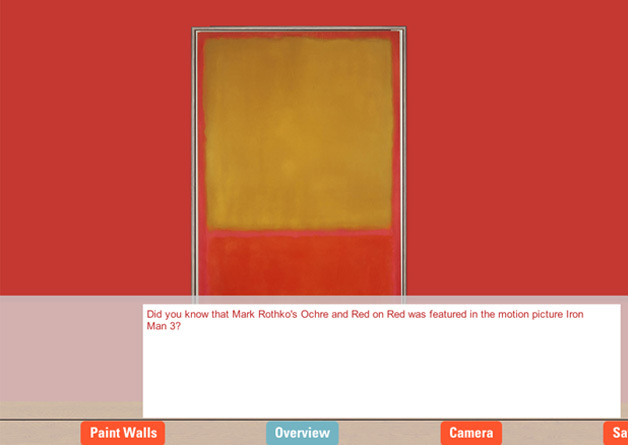 In conjunction with Made in the USA, the Phillips unveiled uCurate: a virtual gallery experience that enables you to curate your own exhibition with works of your choosing, enhance them with your choice of wall colors, and share your personal insights about the pieces in your collection. It’s available in the exhibition galleries, as well as on our website and can run on both Windows and Apple based computers. We began by taking precise measurements of two galleries in our 3rd floor annex space and from there a 3D model was created. Then we uploaded digital images of our selected collection with their dimensions. All objects are scaled-to-size when they appear in the virtual gallery. While first released at the Sterling and Francine Clark Art Institute, we have added some enhancements to the application. For instance, you may “Click to select a theme” which brings up a list of available categories from Made in the USA that allow you to tailor your exhibit even further. You may also click the “information” icon which allows you to get deeper details about the object, putting it into context by discussing its place in the life of the artist, the genre, or other anecdotal information. Clicking on the “Paint Walls” button brings up a palette of wall colors. Simply drag a swatch onto your gallery wall to apply the chosen color. 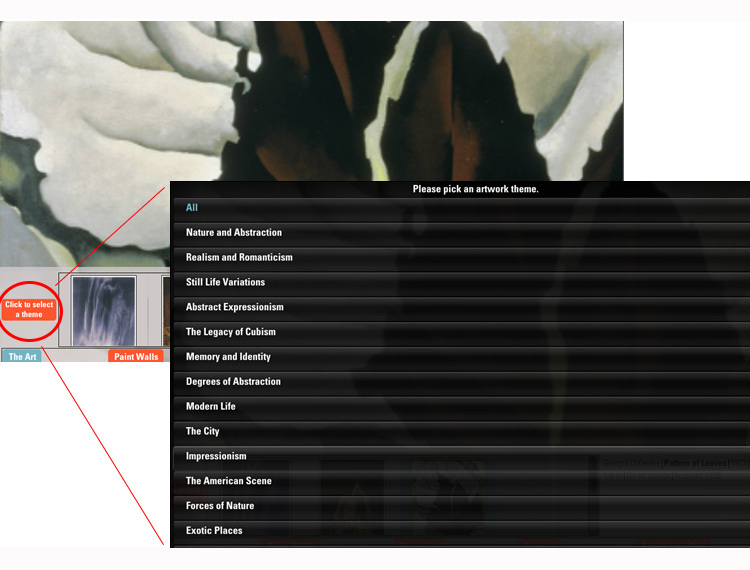 Clicking on “Overview” allows you to add your personal insights about your exhibit. Clicking on “Save” allows you to publish your exhibit to the web and e-mail yourself and friends the link. Share your creations on social media with #MyAmericanArt. Visit often. Look for some prize opportunities soon. Who knows? You may be America’s Next Top Curating Idol! *UPDATE: Our testing participant roster is currently full and testing is in process. Thank you for your interest and enthusiasm! We are launching a mobile Apple and Android BETA version of the uCurate application. We are seeking 15 participants for each operating system (Apple iOS and Android) to help us in the testing process, to provide input before we submit the apps for approval. We ask each tester to test in both a tablet and mobile phone platform, if possible. If you can test in both operating systems, terrific, or only have one device, that works as well. We will stop once we reach our needed 15 testers per operating system, 30 total, filled on a first-come-first-served basis. We will provide you with instructions and questions to which we are seeking your opinions for a testing period of two weeks (April 14th – April 25th). We are soliciting comments and opinions immediately after the period begins. Each tester who successfully participates with this project will receive two free tickets to Made in the USA . If you are interested in applying, please send an email with “BETA TESTER” in the subject line to webmaster@phillipscollection.org and be sure to list the types of devices you will be using to test the application. We will respond to you shortly thereafter. Thank you for your interest in The Phillips Collection.